The Bollywood icon’s husband, film producer Boney Kapoor, also released a statement on Wednesday saying the loss was “inexplicable in words”. “To the world she was their Chandni …their Sridevi… but to me she was my love,” the filmmaker wrote in a post that he shared from his wife’s Twitter handle. On the lines of the statement released by the family, Kapoor also urged media to respect the family’s need to grieve privately. Earlier on Wednesday, Sridevi was cremated in Vile Parle crematorium with full state honours. Hundreds of thousands of people, including Bollywood celebrities, joined the film star’s family to bid adieu to the first lady superstar of India. The last rites were performed by the actress’ daughters Janhvi and Khushi before the body was consigned to flames in the electric crematorium with husband Boney Kapoor standing by. “The past few days have been trying times for us as a family. Today, particularly, has been one of the hardest. We laid to rest a beautiful soul who has gone too soon,” read the statement by the Kapoors, Ayyappan and Marwah families. The funeral, marking the final journey of Sridevi, was one of the largest in Mumbai city in recent times. Sridevi’s funeral, in terms of sheer numbers, is estimated to have attracted the highest number of people, ranking on par with the previous biggest funeral processions — of the legendary singer Mohammed Rafi and India’s first superstar Rajesh Khanna. Sridevi’s mortal remains were flown in a private jet to Mumbai from Dubai where she passed away on Saturday following an accidental drowning in a bathtub in her hotel room. 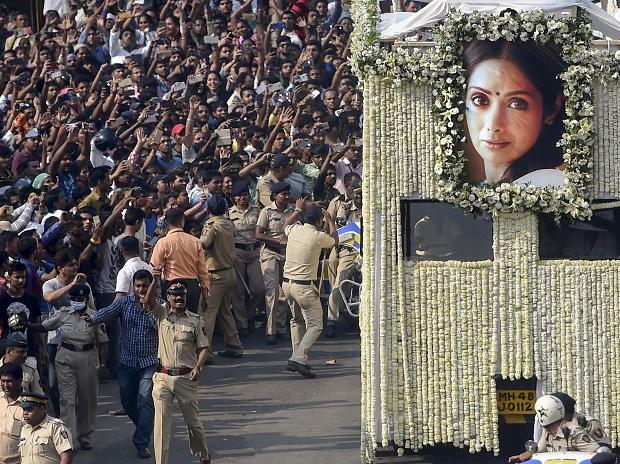 Maharashtra government accorded full state honours for the funeral of Padma Shri Sridevi — that included draping her body in the national tricolour, elaborate arrangements by the Mumbai Police and a gun salute before the cremation. 1. Boney’s emotional letter: Hours after Sridevi was cremated, Boney Kapoor shared a post from her Twitter account where he remembered her as the love of his life. “Losing a friend, wife and mother of your two daughters is a loss inexplicable in words… I am blessed to have the support and love of Arjun and Anshula, who have been such pillars of strength for myself, Khushi and Janhvi. Together, as a family we have tried to face this unbearable loss,” he wrote.